If you were dropped into the Barbican’s new Macbeth, you’d instantly know it was by Cheek by Jowl. Judith Greenwood’s inventive and flowing lighting design, which has become a hall-mark of this company in recent years, would be the first give away. But you’d also sense the tightness of it, the sheer economy – the sense that there isn’t a wasted moment, a wasted gesture or a wasted word. Cheek by Jowl make beautiful theatre, and their latest is no exception. 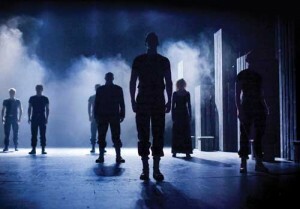 This Macbeth is stylish and sparse, a stripped-down and spartan prop-less production in black and white. The stage feels vast in its emptiness, but there’s not an inch lost in Nick Ormerod’s design and the effect is wonderful. Declan Donnellan’s direction is similarly sparing but equally effective. The small company flow between roles effortlessly – one moment actors, one moment dancers, one moment scenery – without anything ever seeming forced. The ensemble performances are universally strong, but it feels effortless. David Caves is superb as McDuff, all menacing strength and integrity, even in the scene where he learns of his family’s murder. Orlando James is a surprise as Malcolm, most notably in the scene where he expresses his unwillingness to seize the crown; this scene sometimes comes across as self-doubt or uncertainty, but from James it is genuine fear of his own malevolence – which is palpable – which drives the dialogue. Most notable for honours is Will Keen as Macbeth. His transformation from quivering thane to over-confident king is complete, with both roles seeming natural at the time and the other unimaginable. A couple of other complaints. The production was minimalist – fine, I get it – but does it need to be minimalist to the extent that there’s quite so much miming going on and in such an overdone way? I’ve never seen so much fuss and business with the hands while reading an imaginary letter as when Lady M got one from her husband: Legally Blonde thought she might have been peeling a banana. Also curious was Kelly Hotten as the female, Glasweigan porter (or as Legally Blonde called her “the prostitute in a box”) whose costume was in stark contrast to the monochrome militantly enforced elsewhere. But these are minor quibbles: this is a superb production. While it might lack the rigid and intense aesthetic of, for example, Troilus and Cressida, it remains a beautifully designed and realised show. In addition, the performances are universally sound and in some cases excellent. Not to be missed. For a contrasting view, see Life in the Cheap Seats. sorry but I don't agree with you. Quite the opposite actually. I walked out after 1 hour. I thought it was terrible. Not at all professional. One actor in particular didn't even know how to project his voice. Mind you, for 20 euros, what do you expect? I am a member of an amatuer theatre group in Madrid and we charge 12 euros for our plays. I can guarantee that you'll find better quality acting in our shows. I follow your weblog for quite a extended time and actually tell that your articles often prove to be of a high value and high quality for readers. simple but little less on comfort medium of mass transport. There is no way four sets of shoulders will fit, so they uh.